Springtime is always welcome in Sacramento, but summertime can be uncomfortably hot. This May, temperatures were already shooting up to 95�F (35�C), and everyone had begun formulating plans to escape from the heat. 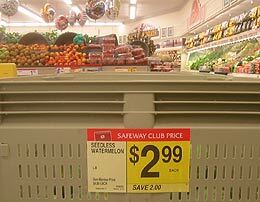 Thursday night, Mike brought home a nice seedless watermelon from Safeway. They were on sale, and he cut slices for Jane, Melanie and I. We sat out on the back porch with them and thoroughly enjoyed ourselves. Eating watermelon on a hot evening is a certifiable simple pleasure�, and it wasn't long before we got organized and ventured to share this experience with the folks around town. Melanie and Jane were interested immediately, and that night at the Round Corner, Chris and his brother Danny volunteered to help. We were going to give out some watermelon. 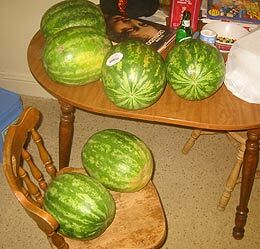 Medium-sized watermelons were on Club-card sale for $2.99 each, so I bought six. 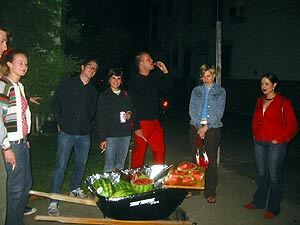 We borrowed a wheelbarrow and a large cutting board, prepared serving trays and selected a big knife. 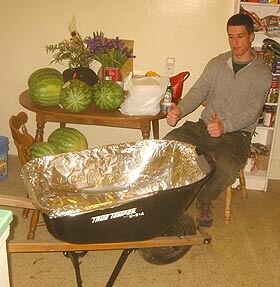 The wheelbarrow was a little rusty, so Mike suggested we line the inside with aluminum foil. That turned out to be a great idea. I used hot glue to attach the cutting board to the front edge of the wheelbarrow. Screws would have worked better, but I didn't want to drill holes in the cutting board. 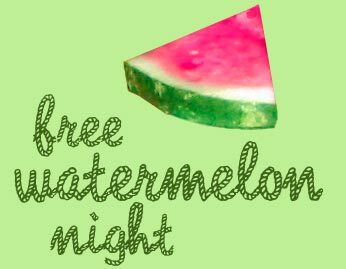 Free Watermelon Night was Saturday, May 24th, 2003. At around 10:30pm, the gang started showing up to help. 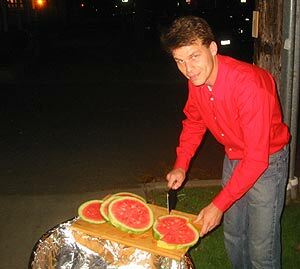 I dragged the modified Cuisine-barrow downstairs and cut up my first melon. They looked great! Watermelon has a very wholesome reputation. I was certain we would be able to convince people to try a slice. 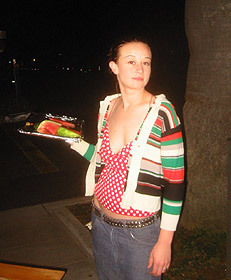 Because smoking inside is prohibited, nightlifers tend to loiter outside bars and restaurants in California. The plan was to cut slices en route and hand them out to these people. Jane was prepared with one tray of slices and Melanie was ready with the other.